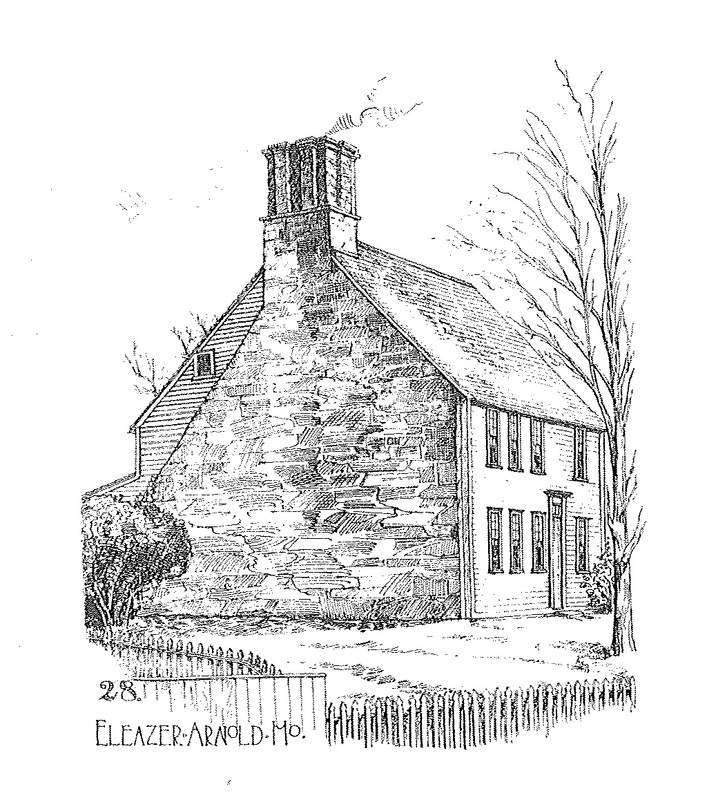 The Eleazer Arnold house in Lincoln. From Norman Morrison Isham’s Early Rhode Island Houses (1895). The earliest houses built in Rhode Island, beginning with the first settlement by Reverend William Blackstone in the area now known as Cumberland, were different from those which were being built elsewhere in New England during the seventeenth century. One style of building in particular stands out for its presence in the formative years of the Rhode Island colony. These houses were known as stone-enders, as they were built around large chimneys made of limestone which formed an entire wall of the house. Early settlers found an abundance of limestone throughout the colony, leading to its use in house construction. Stone-enders were usually two-story buildings with one room per floor. The floors were connected by steep stairs, which were often fit between the front entrance and the stone wall. Windows were often very small and were sealed with oil paper, although leaded glass was sometimes used. The stone-ender style has roots in western England, where similar houses were constructed. The prevalence of the stone-ender in Rhode Island and its absence elsewhere in New England is due largely to the resources available along the Blackstone River. 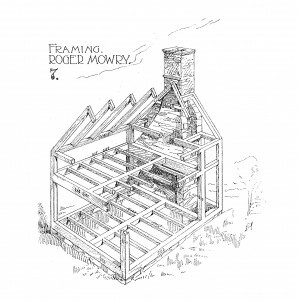 Framing the Roger Mowry house in Providence. From Isham’s Early Rhode Island Houses. 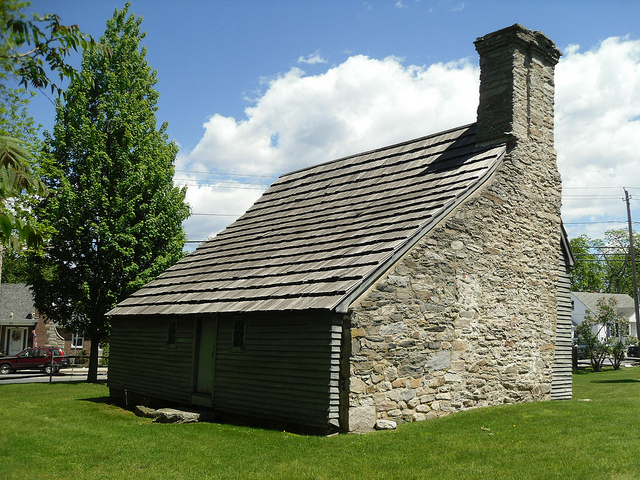 Some sources have attributed the large number of stone-enders in northern Rhode Island to a man named John Smith, a well-known stone mason of Smithfield. Smith served as President of the Colony of Rhode Island from 1649 to 1650 and as President of Providence and Warwick 1652–53. John Smith’s most well-known work was the “Old Stone Castle” of Warwick, which was the only house in the town to survive King Philip’s War. The Castle was demolished in 1779. Unfortunately, many of the stone-enders of the seventeenth century have long since disappeared. The Roger Mowry House, which was demolished in 1900, was, at the time, the oldest house in Providence. The house also served as a tavern, and it was restored by renowned preservationist Norman Isham just five years before its demolition. Although rare, some houses exist today only as stone chimneys, as the home which surrounded them collapsed at an earlier date. One such example of this phenomenon can be seen in the Waite-Kirby-Potter House of Westport, Massachusetts (also an example of a rare Massachusetts stone-ender). 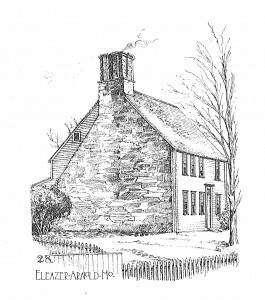 “Rhode Island’s Stone-Ender Houses,” Rhode Island History Online Directory Initiative, 19 December 2012, http://www.rhodi.org. Warwick, Rhode Island, Statewide Historical Preservation Report K-W-1. Providence: Rhode Island Historical Preservation Commission, 1981 (tDAR ID: 145285). Historic New England, Clemence-Irons House, http://www.historicnewengland.org/historic-properties/homes/clemence-irons-house. Oliver Payson Fuller, The History of Warwick, Rhode Island, from Its Settlement in 1642 to the Present Time: Including Accounts of the Early Settlement and Development of Its Several Villages; Sketches of the Origin and Progress of the Different Churches of the Town (Providence: Angell, Burlingame and Co., 1875). 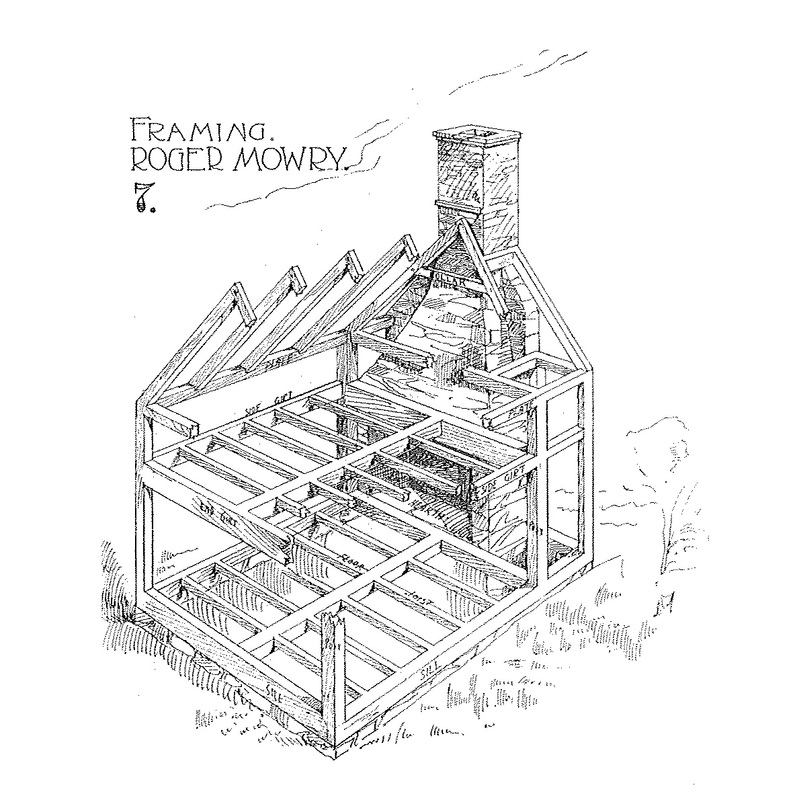 Hugh Morrison, Early American Architecture (New York: Oxford University Press, 1952), p. 71. Thomas Williams Bicknell, The History of the State of Rhode Island and Providence Plantations, Volume 3 (New York: The American Historical Society, 1920), p. 998. William A. Mowry, The Descendants of John Mowry of Rhode Island (Providence: Preston & Rounds, 1909), p. 18. Norman Morrison Isham, Early Rhode Island Houses (Providence: Preston and Rounds, 1895), p. 21. Community Preservation Committee, Westport, Mass., Documentary Research and Archaeological Investigations at the Waite-Kirby-Potter Site, Westport, Massachusetts, Cultural Resource Management Study No. 37, May 2010. This was a really interesting article, especially since I am a descendant of Roger Mowry and several other folks from early Rhode Island. Thanks for providing these insights. “What she said,” in a nutshell, though I’m not a descendant. We Rhode Islanders are proud of our stone-enders, especially as some of the builders have so many descendants, including me. While Norman Isham did save and document many of the survivors, he took a harsh toll on them, usually destroying the more modern additions when he stripped them down to the original. We’re thankful that we still have what survived! Any information on the site that the Rev. Roger Williams settled – was his too a “stone -ender” ? The housing concept and style is much better than that found amidst the Plymouth / Puritan colony’s. Would this be because its origins are in West England …. the migration site notable of those Anglicans and non-conformist to the Puritan Oligarchy ….. other than East Anglia ? Dear Zachary, Thank you for posting the nice article on Rhode Island stone-enders. I just wanted to make sure to share with you and your readers that Historic New England welcomes visitors to both Clemence-Irons House (1691): http://www.historicnewengland.org/historic-properties/homes/clemence-irons-house and Arnold House (1693, open year round) http://www.historicnewengland.org/historic-properties/homes/arnold-house-1 . Please don’t hesitate to call or e-mail me if you are interested in learning more about Historic New England’s Rhode Island stone-enders. Thank you. Thank you for a fascinating, well researched article about 2 of my ancestors. I am descended from both Eleazer Arnold and John Smith the Mason. Traveling to Rhode Island to see the Arnold House, among other things, is on my bucket list. Those of you with such strong Rhode Island “stock” should be very proud of your heritage …. built on the backs of a Puritan minister that saw through the facade of the Boston Oligarchy ! I myself am very proud to be a great grand-daughter (nth) of the only Puritan Pastor that supported the Rev. Roger Williams, the Rev. Stephen Bachilor. He too saw through this facade. If more of our common ancestors had only stopped this so deviant theocracy , the United States would have formed to be a more kinder nation than it is now ! I am interested to know if my ancestors home In Providence R. I., was a stone ender home. His name is Stephen Northup and his home is a part of the historical Homes still standing. I believe in 1655. Thanks.